I have settled in so well and my bezzie friend Tory herself a welfare dog is in love with me, I love her too we play together and cuddle up together at night and Kez also welfare is a bit of a Grump but is teaching me how to be a growed up husky and be respectful. I love my humans too and they love me so I am staying put Auntie says I can. I am such a happy boy. I'm very friendly I try to play but Auntie says I make noises like a Staffie which puts other huskies off so as soon as I learn not to do that I will have loads of friends! Hello Auntie has called me Elf because I'm a bit on the small side and it's Christmas! 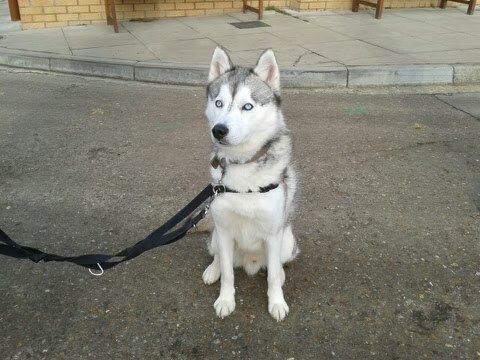 I am currently in RSPCA Kennels waiting for Auntie to find me a foster home. A nice lady from Welfare came to visit me and said I was a lovely boy, I just need some manners and a friend. I came into RSPCA because my owner didn't want me or my best friend who was adopted straight away I miss him very much and am lonely without him and bored. I like people and other dogs, am good on the lead and will be a lovely addition to your family.